Barre style workouts are becoming more and more popular, but I am still frequently asked what the heck Pure Barre is when I mention being a PB instructor. Before I was an instructor, I was a client! When my best friend first invited me to try a class with her, I reluctantly told her no. I was already practicing yoga and considered myself "fit" and besides, I had never taken a dance class in my life and didn't want to feel embarrassed. She and I both have a tendency to push each other (usually into being our best selves) so after the 10th invite or so, I gave in. I had little expectation going into my first class, but made my friend promise me it wasn't going to be a dance-type of class (she reassured me it wasn't). Hurdling over my own fear to try something new and unfamiliar, I signed up for my first Pure Barre class and never looked back! The following are 7 things you should know about Pure Barre, if you haven't already discovered them for yourself. 7. Socks Are a Must! 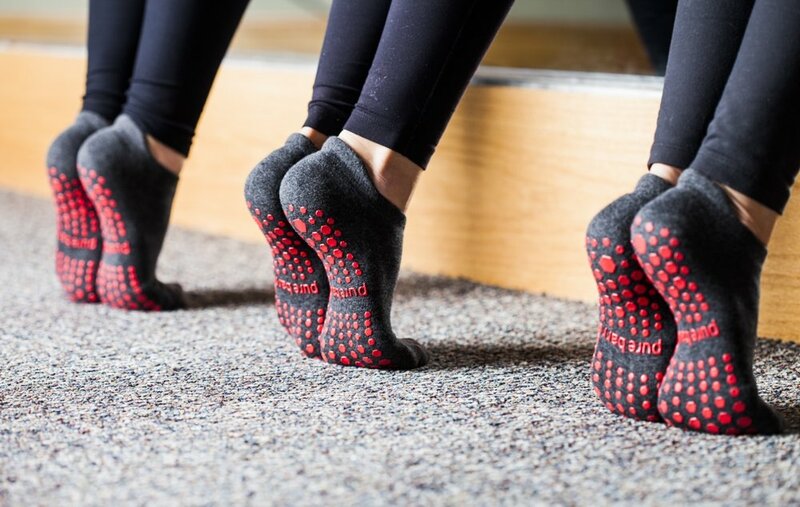 When preparing for your first Pure Barre class, make sure you bring a pair of socks (grippy socks are preferred, but not necessary), a water bottle and a good attitude! The dress code is similar to any other fitness studio, however no shorts are allowed. If possible, check in at least ten minutes early so you can fill out the waiver and get a thorough introduction before class! This is very helpful to those on their very first visit. The teacher will help you get the right equipment needed and give you a quick run down on the Pure Barre lingo! 6. The Class Flow is Always the Same. Pure Barre is a fast-paced 50 minute workout utilizing the ballet barre (not a stripper pole, I actually get this question a lot, think horizontal barre not vertical) meant to strengthen the entire body by using isometric movements. The workout itself is low impact and offers many modifications for those with injuries or ailments. Each class is music driven and high energy, which I love. It is not set up to mimic a ballet class and I promise I will never ask you to do a pirouette, unless maybe it's April Fool's Day. The types of movements you can expect to see range from planks to pushups, to barre specific movements utilizing the ballet barre. While the flow of each class is the same, the individual sections vary per class, never allowing the body or mind to become complacent. You will always leave class feeling challenged, veterans and newbies alike. 5. It's Okay to Let Yourself Be a Beginner. When asked to compare a Pure Barre class to something else, I have a hard time doing so. The movements and terminology are so unique and unlike any other forms of exercise. It's okay to let yourself be a beginner, everyone is at some point! Like with anything else, the more you practice the more you will gain knowledge and understand the technique. There is also an aspect to class that requires a mind-body connection. Again, something that isn't easy or natural for most of us. With each class you will feel stronger both physically and mentally. If you find yourself having a fear that people will watch you and find you out to be the beginner that you are, don't! Everyone in class is so focused on themselves and the pain they're feeling (hurts so good) that watching you is literally the last thing on their mind. If you lock eyes with someone more than likely they are new too, thinking the same things you are! Lastly, don't be afraid to ask questions before and after class either. We love being able to help you through your journey, so please ask. One of the PB attributes I am so appreciative of as a client is the willingness to stay current and competitive in the industry. The franchise is proactive about researching and testing out different ideas, to ensure that the clients are always getting the best work out possible. Each quarter, the exercises change to ensure fresh and challenging combos for the clients. In addition, Pure Barre has recently added a cardio driven class called Empower to the scheudle, which clients are really loving. There are plenty of new and exciting things to come, so stay tuned! 3.The Investment is Worth it! I'll admit, one of the reasons I was so reluctant to try my first Pure Barre class was because I knew the classes weren't cheap. If I did love the workout and wanted to join, I would be out over $100 a month. Pure Barre's packages and membership fees are in line with most boutique fitness studios. I signed up for the New Client special right after my first class finished, because I knew I would see results (and I did). It's nice that you can join a gym for as little as $15 a month now, but if you don't really go or push yourself that hard when you do go, then you'll never see results and that $15 a month is a total waste. If you have the means and you want to see results, Pure Barre will deliver. For me, the investment in myself and my goals was worth the higher price point. There's also a bigger sense of accountability when you decide to invest that much in your health and wellness. The workouts mean a little more! Plus, if you actually enjoy your workout you'll have more reason to go in those moments that you'd rather be a couch potato at home. *It's also worth mentioning that PB offers your first week free and there are often discounts for teachers, nurses, students, etc... so be sure to ask! 2. You'll Be Apart of a Community. This is another huge factor as to why the investment is worth it. I have never experienced such a tight-knit community before! Strangers becoming good friends with each passing class is not something out of the ordinary to see at a Pure Barre studio. The studio itself is a safe space, allowing everyone to be vulnerable and open! The collectiveness that Pure Barre offers also adds a layer of accountability. If you set up a time to meet your barre girl friend for a PB class and then coffee, you'll go. Accountability, motivation and inspiration fills the studio and keeps clients coming back. The confidence and friendships I have witnessed with so many of my clients are truly special and unique. 1. Pure Barre Will Make You Happier. Aren't we all just searching for happiness? If seeing results, creating new friendships and attending a fun workout geared to get you outside of your own head aren't good enough reasons to convince you that Pure Barre will make you happier, then check out this article a client shared with me recently. She received it from her work (which happens to be at a hospital) a few weeks after joining Pure Barre. Pretty amazing! If you are planning to try out a Pure Barre class, I highly suggest watching this super short intro video! It will give you an even better idea about class and some of the terminology often heard throughout class. If you belong to a Pure Barre studio, leave your city below in a comment. Thanks so much for reading!